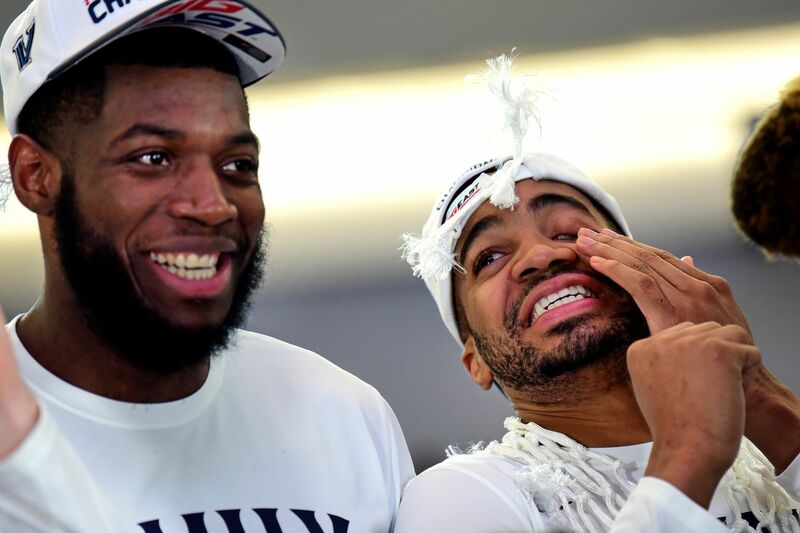 Villanova will be relying on seniors Eric Paschall (left) and Phil Booth -- again. How they got here: Villanova, Big East Tournament champion; Saint Mary’s, West Coast Conference Tournament champion. Coaches (NCAA record): Villanova, Jay Wright (27-13); Saint Mary’s, Randy Bennett (4-6). Head-to-head: Saint Mary’s leads, 2-1; won last meeting, 75-68, in second round of 2010 NCAA East Region. The scorers: Seniors Phil Booth and Eric Paschall have shouldered the scoring load all season for Villanova, combining to average slightly more than 35 points per game. The Wildcats have had a number of players — Collin Gillespie, Saddiq Bey, Jermaine Samuels — act as a third scorer over the last month but could use two or all of them to do it in the same game consistently. … Saint Mary’s also has a 1-2 scoring punch in junior guard Jordan Ford (21.3 ppg) and redshirt sophomore forward Malik Fitts (15.3). Counting Tanner Krebs (8.9), the Gaels’ top three scorers all have hit more than 50 three-point baskets and shoot better than 49 percent from the arc. The defenders: Paschall has shown an ability to guard all five positions on the floor in the Cats’ switching defense. Gillespie probably will see the most time guarding Ford. Samuels is emerging into an important defensive player, as his four steals in the Big East Tournament would attest. … Jordan Hunter, a 6-foot-10 senior center, leads the Gaels with 45 blocked shots and established his career high in rebounds, 15, in his team’s upset of Gonzaga in the WCC championship game. Ford has a team-high 43 steals. Don’t be surprised if ...: Villanova employs its three-quarter-court zone press more often. Wright has wanted his players to be more focused on their half-court defense, but will be more inclined here to try to quicken the tempo against a Gaels team that plays at a more deliberate pace.